If you are looking for the perfect bodypainting color for airbrushes, you should definitely have a look at the Senjo-Color Basic. It is ideal to be used with airbrush and also as a liquid for the brush. Elaborate details and large primers on the body are easy to apply. The cosmetic formula also allows its use on the face. For fine nuances you can dilute the colours with the thinner to make them appear more glazed. The entry into a wide range of colours for decorative cosmetics. 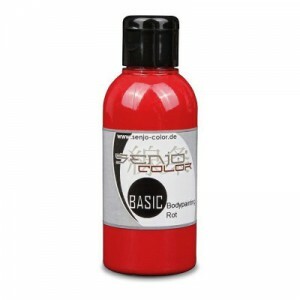 Many bodypainting artists from all over the world love the BASIC. Many a podium was climbed by body painting world champions who trusted the Senjo-Color Basic. High pigmentation and colour intensity characterise the Basic. Thanks to its light transparency, it is excellent for mixing. You get clean, colorful blends. Models love the pleasant feeling on the skin and the subtle smell of the body colour. If the work of art is to be washed off again, this is quite conveniently possible with water and soap. Photographers love the matte finish, which gives you high quality images without the annoying shine. With the airbrush you can not only quickly prime the whole body evenly, but also spray fine details. Whether freehand or with stencils, there are no limits to your creativity. 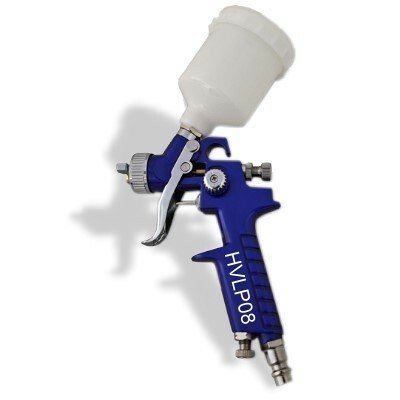 For the large areas, it is best to use an airbrush with a large paint cup and a nozzle size from about 0.5 – 0.8 mm. 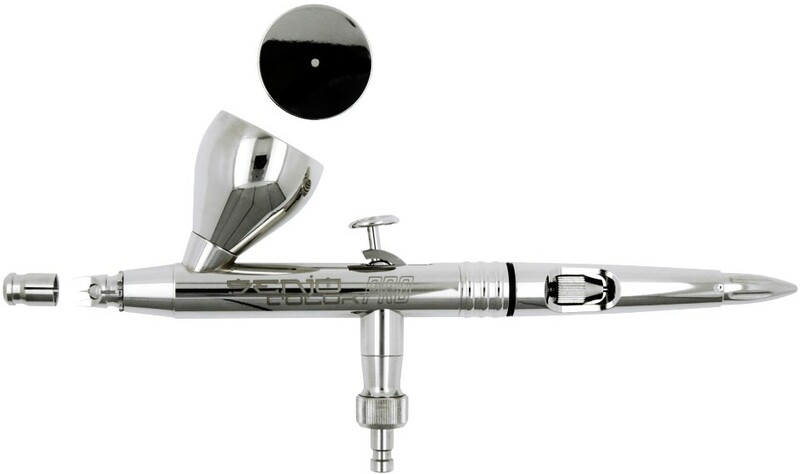 For fine details you can use between about 0.6 – 0.8 bar nozzles from 0.2 – 0.4mm. This depends on the airbrush model, air pressure and colours. Thus metallic shades from 0.4-0.6mm flow better out of the airbrush. The compressor should deliver air from about 8-16 litres/min. For the large guns from about 32 litres/min. The correct setting of the air pressure is very easy to determine. 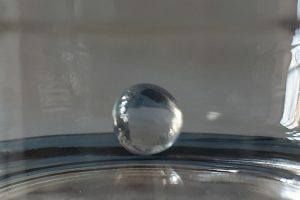 Test your airbrush with water. So you can be sure that you have already fulfilled the airbrush side tasks. Now you can exchange the water for paint and test if everything works. If the desired result is not shown yet, there is another trick. Now turn the air supply to nearly ZERO. Press the finger lever and slowly admit air. Step by step you feel when the first colour comes and when the right combination of air and colour flow has been achieved. You can simply use water for cleaning in between. For the final cleaning, or to dissolve dried colours, we recommend the Senjo-Color Toolcleaner on alcohol basis. Due to the fine pigmentation and production of the colours according to the strict guidelines of the European Cosmetic Decree, you can also use the colours as airbrush make-up. For example, you can remove the sand color, mix it with thinner and yellow/red tones; or conjure silky rouge tones, shades and highlights in your face. 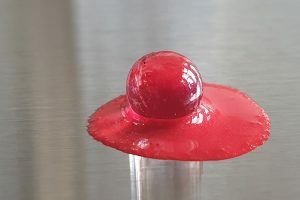 For a slim model 75-100ml can already be sufficient for priming. If you prime with a sponge, plan on a lot more. About 100-150ml should be enough. Depending on the actual skin area and the desired degree of coverage, you should not forget the corresponding reserves. The skin should be clean, oil-free and dry. Residues of greasy body lotion, sun cream etc. must be completely removed. Since Senjo Color contains a lot of pigments, it must be shaken well before use. The particles settle and then lie on the bottom of the bottle. The longer the bottles remain unused on the shelf, the more solid the sediment is. To make it easier, we add shaking balls to each ink bottle. These should be clearly audible when shaken. So shake until the balls hit the bottom of the bottle audibly. After a long period of time it may be necessary to sieve. For this purpose, use paint sieves or the good old ladies stocking to filter out particles that are too thick. For a body painting under “normal” conditions an additional fixation is not necessary. This depends on skin type and ambient temperature. This is how we have already realised water photography without fixing. The colour then becomes soft and can quickly blur. If the shots are in the box first, everything’s fine. Sometimes, however, special measures are required. If the color should hold better, you can fix it. Most important principle: As thin as possible. So a few thin layers of paint hold better than too much paint. Spraying fixing spray on is often sufficient. Don’t ask too much here either! Less is more here too. A whiff will do. Some users also report the Fixierspray as a kind of primer on the skin before the Bodypainting. Since we don’t know your model’s skin: Try it out. And please, don’t be too fat. For extreme film situations, many make-up artists switch to Senjo Tattoo Ink. However, this alcohol-soluble paint is not a cosmetic and should therefore only be used by professionals. In addition, the desired color shade must then be mixed together itself. This again requires experience with colors and color theory. And a lot of effort to remove. Do you have any more questions? Then send us an eMail, or use our contact form. We’re here for you with pleasure.